Balearic Islands Mediterranean city on the bay of Palma. Whether you are looking for a property, or your next holiday destination, Palma, with its capital "Palma de Mallorca and the Port in the Bay of Palma, has much to offer. The bay of Palma, is the capital of Mallorca - Palma de Mallorca in the southwest of Mallorca and covers an area of 208 square kilometers, the smallest of the six landscape of Mallorca. Palma covers located on the southwest coast of Majorca approximately 30 km west of Magaluf in Majorca to Arenal (East Palmas). In the northwest Palma borders the mountain range of Sierra de Tramuntana. The sandy beach Platja de Palma extends to the east of Palma, about 10 km up to Arenal. The bay of Cala Major is located west of Palma. The historic old town is the center of the city of Palma de Majorca and is surrounded by ring roads, urban areas and a ring road. A little further outside of Palma de Mallorca are industrial areas, suburbs and small independent communities. The congregation includes, besides the downtown Palma Palma de Mallorca for about 30 more villages. In Palma de Mallorca sits not only the autonomous government of the Balearic Islands, Palma of Mallorca is also the supply center. The port in the Bay of Palma is the largest and economically most significant port of Majorca. Mallorca's airport is also located in Palma. 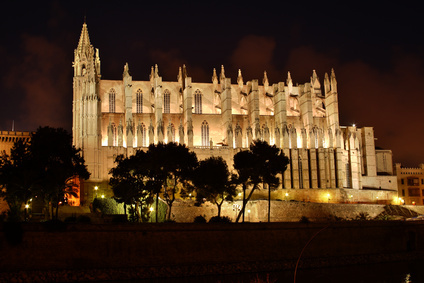 The Gothic Cathedral La Seu is one of the greatest sights in Mallorca. 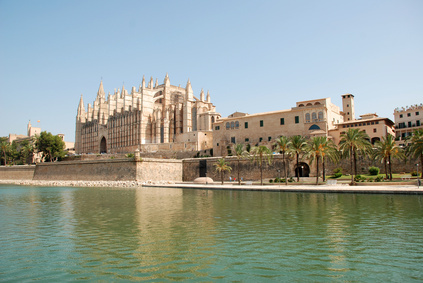 The cathedral is located in the south of the old town of Palma de Mallorca. The Royal Palace (residence on Mallorca) is next to the cathedral. 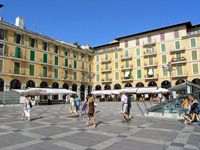 The old town of Palma de Mallorca was dominated by Spanish-Catalan and some Arabic influences. 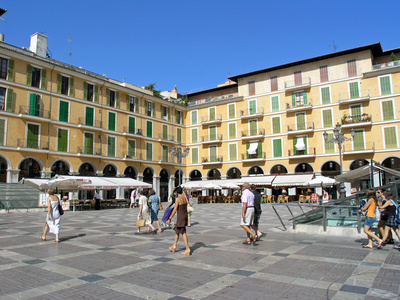 From the middle of downtown, in the Plaça Major run, numerous narrow streets, mostly accessible only to pedestrians, through the old town of Palma de Mallorca. The Castell de Bellver, a medieval castle located in the southwest, just outside the old town of Palma de Mallorca harbor. The famous painter Joan Miró painted, lived and died in the suburb of Palma de Mallorca Cala Major. His studio can be visited. In addition, some of his works in the contemporary Museum of Palma de Mallorca Baluard It can be visited. In Palma is home to almost 400,000 people, nearly 50% of all residents in Mallorca. Palma therefore has the highest population density of Mallorca. 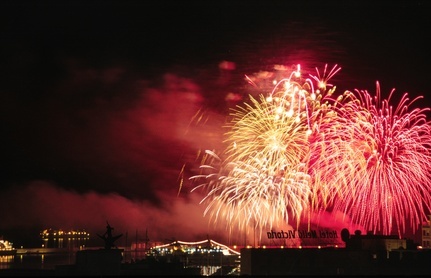 The foreign population is growing annually and is currently Palmas at about 20%. The Roman consul Quintus Caecilius Metellus Balearicus captured with his army in 123 BC, the Balearic Islands and founded the city of Palma in Majorca. The suffix "Balearicus" was a Roman award for his success in the conquest of the Balearic Islands and Mallorca. 903 conquered the Arab / Muslim Mallorca and Palma was an Arab-Islamic culture. 1229 distributed the Argonian the Moors from Mallorca. Jaume II in 1276 founded the Kingdom of Mallorca. 1349 Mallorca Aragonese province. In the 19 Century begins, tourism in Majorca. Autonomy of the Balearic Islands in 1983.